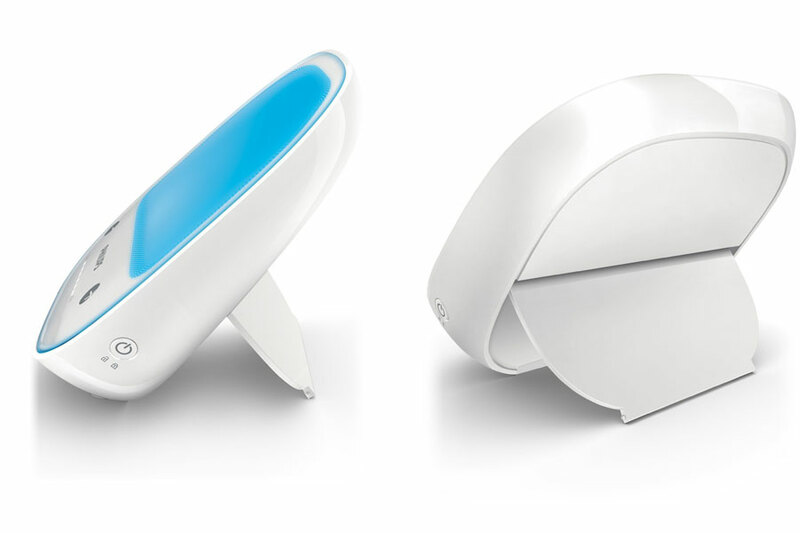 Summary: A stylish compact and easy to use SAD lamp that uses blue light. This blue light stimulates special receptors in the eye that trigger the body’s natural response to sunlight, mimicking the energising power of a bright sunny day. You may be aware of SAD lamps and the bright white light that they give off up to 10,000 lux, well the Philips GoLITE Energy Light is slightly different the light is blue. Over recent years there has been scientific research that shows that within the spectrum of colors contained in daylight, blue is the most energising one. 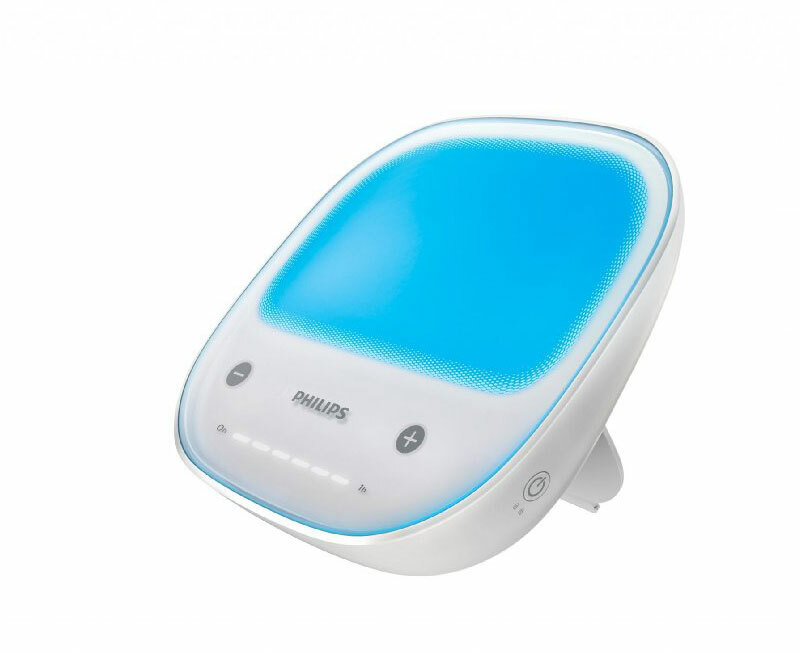 The Philips GoLITE BLU Energy Light rechargeable replaces the previous older version the Philips HF3330 goLITE BLU Energy SAD Light with a newer design that is very sleek and has a glossy white outer casing with a warm sky blue edge to it, this model is the rechargeable version which has a few extra feature and buttons to the front of it. The Philips GoLITE BLU Energy Light rechargeable is a compact design making it ideal to take with you to work or when working away. This model has a rechargeable battery as well as a power cord for use anywhere making it ideal for travelling with. There are 5 light intensity settings as well as a travel lock. In terms of brightness this is 200lux but is reported to be as effective as a 10,000 lux white light that you may see on other SAD lamps. There is a power button to the side of the unit, with plus and minus buttons to the front that adjust the light intensity where you can adjust between 5 settings. There are 5 light intensity settings which can be easily adjusted at the front, there is no timer on this light, however there is a handy gauge that lights up on the front. From zero to 1 hour there are little segments that light up blue every 10 minutes so you know how long you have be using it, each segment represents 10 minutes and it goes all the way up to 1 hour, so 6 segments in total. There is a handy stand that folds out at the back, and folds away when not in using making it very compact and easy to pack. This is great for travelling with as it has a rechargeable battery built in, a single charge will last 60 minutes of single use. It is very compact too and perfect for taking away with you. There are not many buttons and it really is easy to use, turn it on, adjust the brightness up or down it needed and there you go. It is that simple. Just 20-30 minutes use – Feel the benefits of this with just 20-30 minutes a day. Combat jet lag & travel – Use to help with time zones and combat jet lag by effectually adjusting your circadian rhythm. Battery Powered – No need for a mains power socket as it comes with a rechargeable battery. Compact design – Making it easy to take with you to work, on holiday or when travelling. LED Light – There are no bulbs, just clear blue warm LED light. The Philips goLITE BLU also comes with a 2 year manufacturer warranty. This is a great light and works well, if you do not feel you are feeling much improvement with a white light SAD lamp then this blue light could be worth a shot as it is also proven to work and help with your energy levels and improve after just two weeks of use. 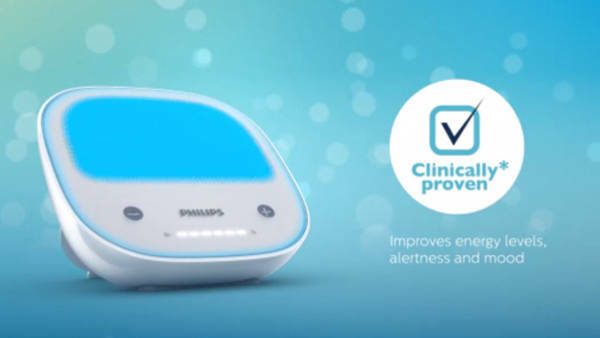 Philips also report that ’84 percent of users were satisfied with the way Philips goLITE BLU helped them to fight winter blues’. If you want a compact and portable light then this is certainly worth considering, the only drawbacks are when compared to its previous model (The Philips HF3330 goLITE BLU Energy SAD Light), this included a little case for it, and had a timer, which this model does not have or include. But apart from that is looks and works great.